When? - Sunday 5 April from 8am New York time, 1pm London time, 2pm Paris time, 10pm Brisbane time. Yes we realise this is Easter Sunday, but yesterday the clocks all changed in Europe (one hour less sleep) and the weekend after I am not available to host the call. The timing of this one session has been chosen to hopefully allow as many people to join in compared to previous round-tables. The timing of future ones will be varied to suit everyone if need be. What do I need? - just a micro-phone and some head phones(in ear phones work fine) and a free Skype account. Using headphones or earphone reduces 'echo' on the call. If you have a webcam then you can join in on video as well, but this is optional! A tea or coffee and some chocolate Easter eggs! Hope to be chatting with you on Sunday 5 April 2015. 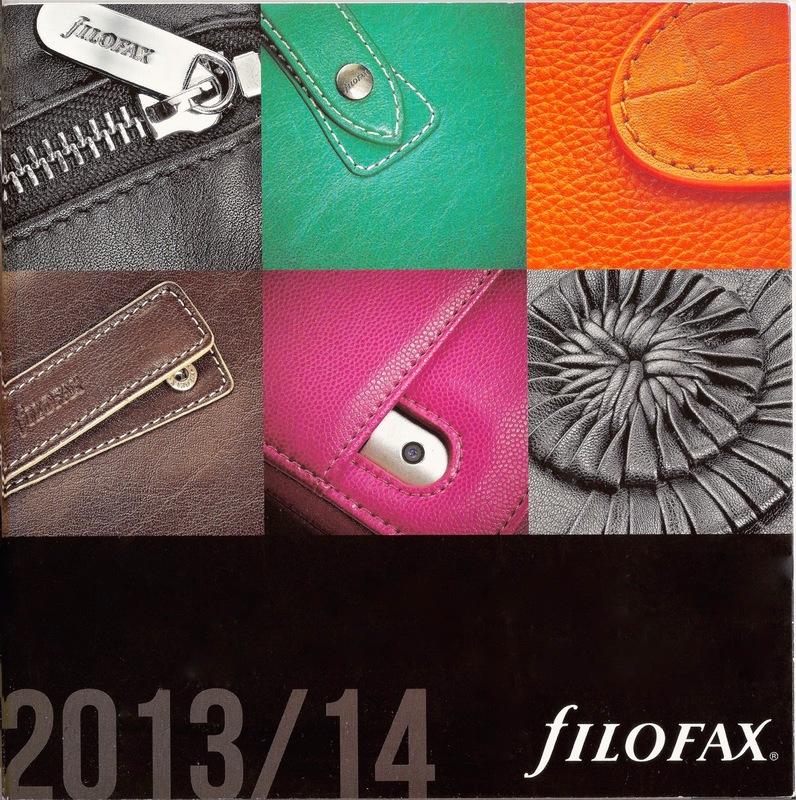 Today we look back to the recent times of 2013 to see the product guide for 2013/14. The content of this post is the intellectual property of Filofax Group Ltd. The scans are reproduced here with the full permission of Filofax Group Ltd.
Today I would like to introduce you to Natasha. Being an optimist with a dry sense of humor has gotten me out of alot of tricky situations. Now I 'homestead', this term is used very loosely, in suburbia with a husband, 3 dogs, 1 cat and 5 chickens. While I work for a large corporation in a 'satellite' office (OK, it's a room in my house) I balance my days with cooking, organizing, crafting, vlogging and occasionally showing my mug on camera. Cooking has always been one way I express my love which explains the amount of leftovers friends and family are usually sent home with after social events. A large part of my brain is geared to solve problems, work related or not, I see the big picture and tend to approach things from the point of view - I can fix pretty much anything - stopping short of surgery and tooth removal. I first fell in love with all things paper when I was 5 years old on a visit to my grandfather's accounting office and have been hooked ever since. You are more likely to find me in Staples than Nordstrom or Harrods. Ironically I work in a the tech field but there is just something very comforting about writing on paper that I'm not ready to replace entirely. 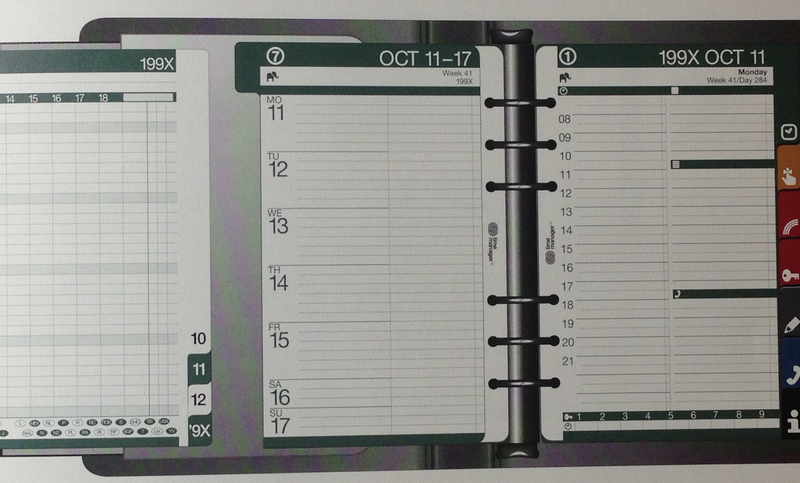 I was introduced to planners/organizers at my first full time job in 1988 but now can't even recall what it was besides the fact that it was ringed and the company I was working for provided calendar refills. I'm always keeping an eye out for new or interesting organizers and just how much customization they offer but at the moment I'm eyeing the Erin Condren planners because of the cover flexibility. My current favourite, purely based on use, is the Black Personal Metropol which is my wallet. I love the fact that it's utilitarian, faux leather and stands up to being tossed around without fear of scratches or dents. At the moment I have 10, 9 Filofax and 1 PlanAHead find that is in personal size that I keep for my husband. They are primarily black, violet and purple because I find them timeless. The Pocket Sketch in black, it was a giveaway prize from an online friend which reminded me just how much I enjoy writing on paper vs. keeping track of life on electronics. I am primarily use my organizers for scheduled events, projects, plan weekly menu, receipts, appointments and most unusual part of my daily tracking is the number of eggs from our backyard chickens. It's all about the rings for me. They make the customizing possibilities endless, challenging for me to find new ways to use my organizers. I only 'carry' one and that one is on a wristlet which is clipped to the top ring. I find it easy and convenient to grab and go out the door. I have yet to see a Filofax that I MUST have but I always check for new arrivals. Using the Rapesco Adjustable Diary Punch for A5 inserts by making a couple of simple markings (I did a video along with all the math so it's easy peasy). Your utmost dedication and the passion you share with your readers/followers/subscribers. It's infectious! Not sure there is anything that I dislike. No but I think it would be lovely if there is one driving distance from my home. Clooney, Pitt is simply too pretty and a girl just can't compete with that, lol. As you know we are constantly looking for new people to appear in our 'Reader Under Spotlight feature, you don't have to be 'well known' or a long term user to be considered to appear in this 'spot'. 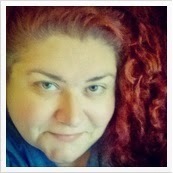 So now it is time to enjoy a small collection of blog posts and videos from around the internet. Pocket Malden using DIYFish inserts - One Fantastic Find! Personal size DIYFish inserts with Day on 1 page for work and personal use. - One Fantastic Find! 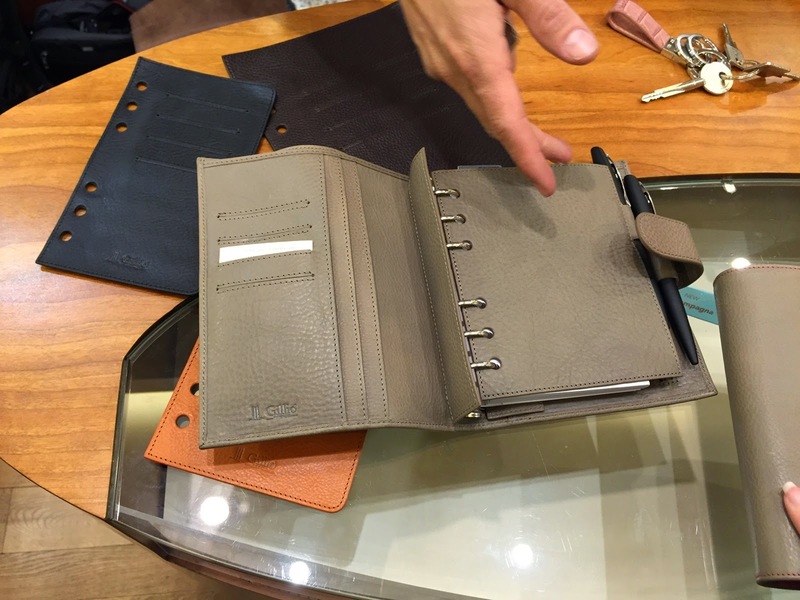 Quick look at the IL Bisonte Insider medium planner - One Fantastic Find! A look at the pocket dividers I added - One Fantastic Find! I just recently discovered the joy of printable planner pages. I admit I was resistant, for years. But I finally caved and I'm so glad I did! I keep it as simple as possible and print directly onto A5 size paper so there's no cutting (which would result in disasterously uneven edges due to my terrible cutting skills). I'm loving the freedom of not having to rely on any retailer to produce the pages I want. I just print and go! It seems to me that printables are becoming more and more popular these days as mass-market retailers offer fewer options. There are loads of downloadables online such as the free printables here on Philofaxy or for sale on other sites like Etsy or people's blogs. Do you use printable planner pages? Why or why not? And as always on Fridays, feel free to discuss and/ or ask anything ring-binder related. This last weekend I attended the Gillio meet up in Brussels and Antwerp. It was quite an event, I travelled to Brussels on Thursday so I could offer some help to get things ready and to meet the team at Gillio. Mella met me at the station and we took a short metro ride to the area of Brussels where the Gillio Boutique is located. 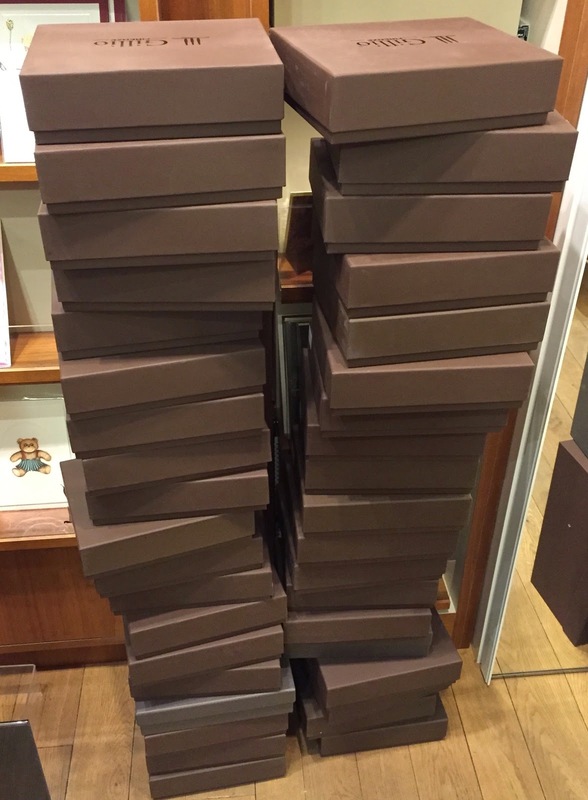 My offer of help was very welcome, no sooner had I arrived at the shop in Brussels I was helping to unpack lots of different organisers and 'oh Steve can you please check the rings on them all' !! Good job I had my 'rings toolkit' with me!!! 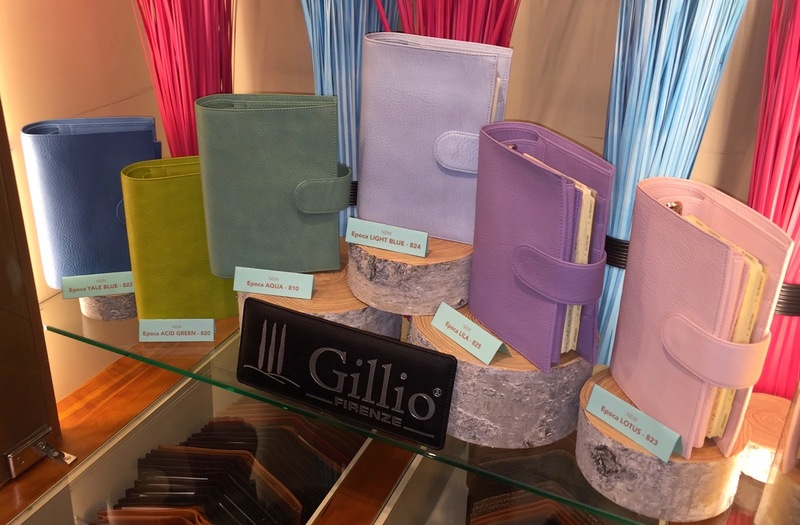 At this last weekends meet up, Gillio Firenze revealed their new range of pastel coloured leathers. A more detailed report will be published tomorrow. Initially shown in their Mia Cara range, they said this range of new colours will be added to their other organiser models over time and possibly to some of the non-organiser products as well. Naturally the reactions from the people present and on the Gillio Facebook group have been very positive about the new range of colours. The video of the new collection. We were shown a prototype of their new A6 size, which included various design elements that had been suggested at the Gillio Think Tank that was held in London last June. 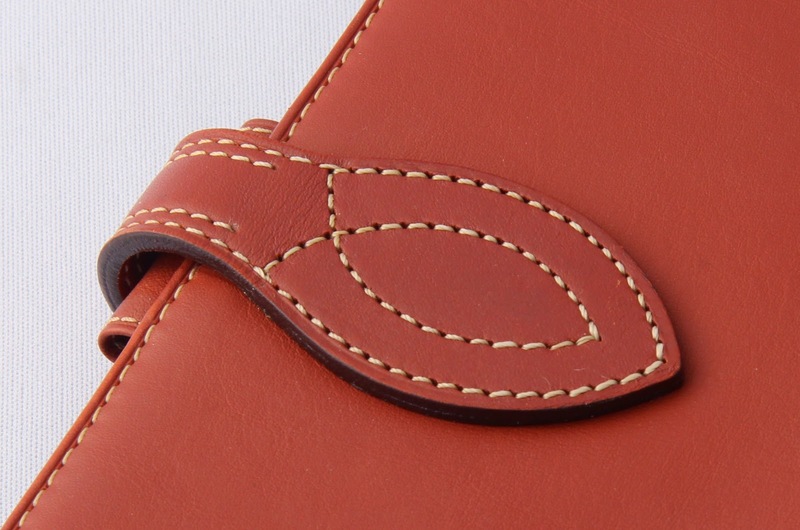 They also showed us some new fly leaves with integral credit card slots, another suggestion from the Think Tank. Taken from the Gillio Website. Thanks everyone for the wonderful responses to our new Pastel Collection! We only had a few prototypes of each colour, and many of them were sold at the store during the meet-up already. The last remaining prototypes will be sold on our website on Thursday, March 26th, at 11 o'clock CET. The ‘full' release of the Pastel Collection will be around the end of May, in Pocket, Medium and A5 Mia Cara. Other styles and sizes will be available later on, once more leather is produced. Pre-ordering is not possible. We were happy to see that the A6 Compagna (with full length back pocket and removable ring protectors) was also a success! The design will now be evaluated and ‘tweaked' to perfection. We expect to be producing it by July. And, last but not least: loose flyleaves! 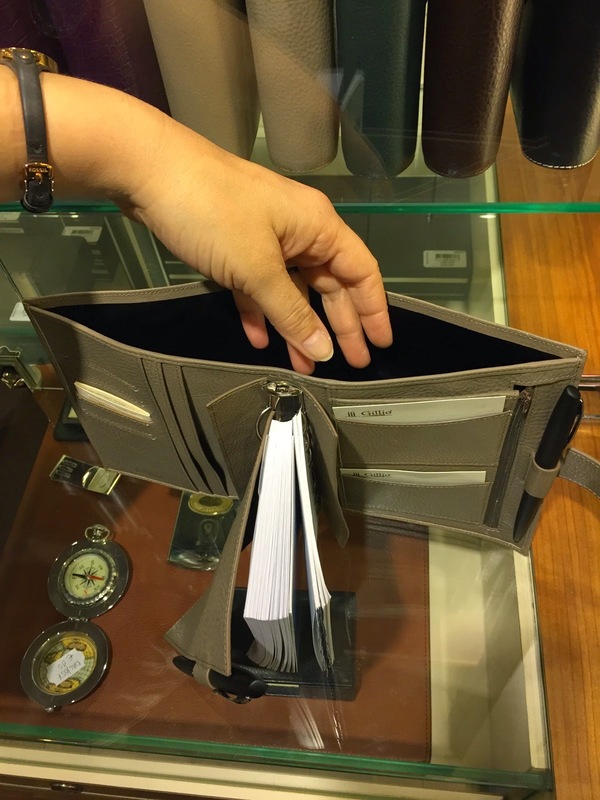 We have different models - with pen-loop, with a zipper, with credit card pockets... They will be available in Pocket, A6, Medium and A5 size and in different colours. They will be available around July as well. 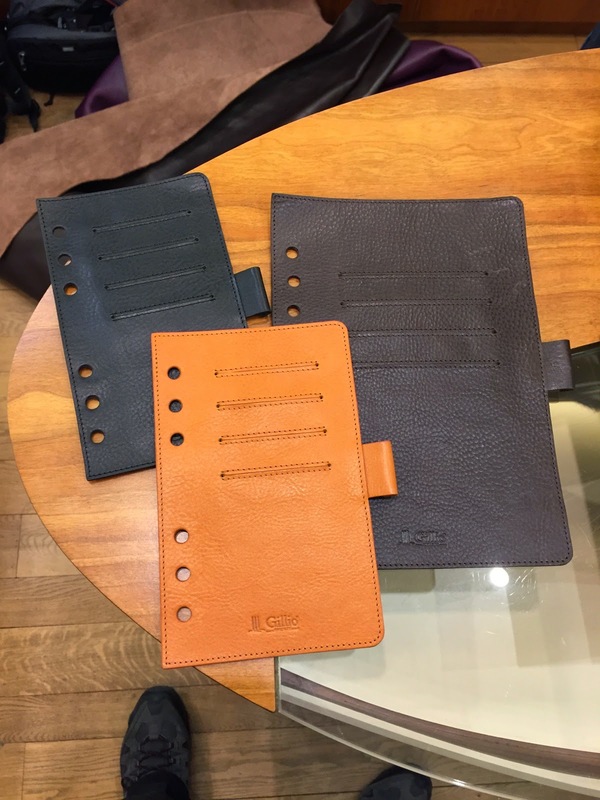 Thanks again for all your enthusiasm and we are looking forward to a colourful summer with our new epoca leathers! 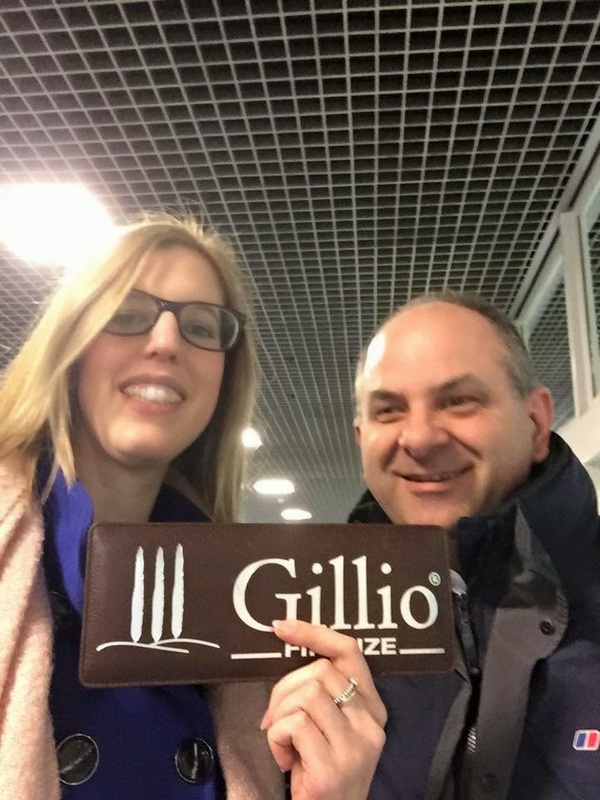 A big thank you to Ben, Tom Van Haelen and the rest of the Gillio team for hosting such an exciting event. This week we go back to look at the UK catalogue for 2012-2013. 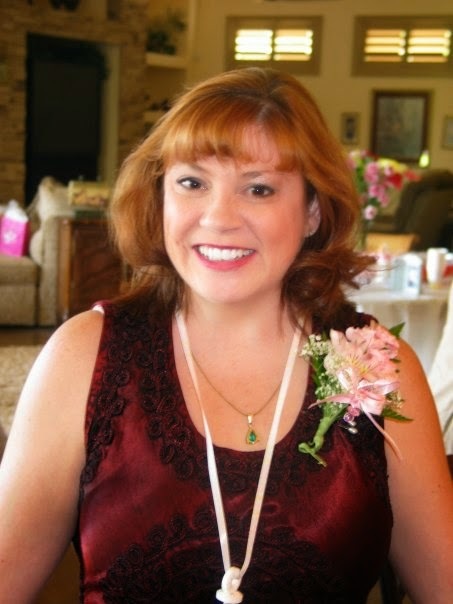 Today I would like to introduce you all to Laurie. My first organizer was the ARC system from Staples. It's bright pink. I bought this is in September of 2014. Up until then I was using the At-A-Glance student calendar. I needed something that worked more as an organizer than a date book. I currently have the Filofax Lemon Patent Compact, Webster's Pages binder in Skyblue, a Franklin Covey Macaroon in Black and a Kate Spade Filofax in Red. I love them all and have purses to match. I love the personal size, its just the right size to put into my handbag and to hold all my stuff. Currently I own five. I started on this journey in September, now it has turned into a full blown addiction. I love that I can carry around everything I need to keep track of the many schedules in my life. There is no more forgetting to pick up one kid because the other kid has to be someplace else at the same time. I love that they are so busy and have such full lives but it does take some planning. That would be the ARC planner. Its not very old but as I said I am a newbie in this world of personal planners. I use them to keep track of the schedules of a very busy family of four. Siena (my 14 year old) is on a dance competition team and has dance three days a week, as well as many other rehearsals and shows. On top of that she is very active in school working with the drama department and of course she is a social butterfly. My 11 year old, Ani is a total sports junkie, so we have basketball, soccer, track and bike club schedules to contend with as well as all her school and social activities. My husband travels for work so I need to have his schedule at the ready as well as my own schedule. I also keep master copies of the girls teams schedules in my binder. I also use it to schedule errands, and any volunteer work that I do. Inside my binder you will also find my reading list, my to do list as well as grocery lists and the such. My planners are definitely work horses. I have six sections in my planner at all times. After my dashboard I have the monthly calendar pages, this is where I put everything into before it goes into the weekly pages. The next section is the weekly pages. I keep four months at a time in my binder and I spend time each Sunday night decorating and updating the info for the following week. The next section is my To Do lists. This usually includes things like "pick up dry cleaning, rhinestone Siena's costume or schedule orthodontist appts". Then comes my Grocery lists, I update this as we run out of things. Then I have a section for keeping track of my reading lists. I found a great print out on Pop Sugar that I am currently using. Then I have a pocket for all my inserts, like master schedules for my girls activities as well as the school calendar. Like I said my planner is the control center of my life. This is going to sound strange but I love the rings. They line up perfectly and hold a lot of stuff in place. I would probably add a little pocket for my smart phone. I toss it into my purse, on the passenger side seat of my car and it ends up on the kitchen counter quite a bit too. I am so glad its sturdy and easy to wipe down if it gets smutz on it. Right now I am lusting after the personal sized Domino in turquoise. Oh yeah I am so buying it and a purse to match. I spent roughly 118 on my Kate Spade for Filofax in red. I love the idea of a laminated To Do list that I got from Alexis at http://www.strangecharmed.com/. The people are by far the best! I love that everyone is so willing to help everyone else. There is no competition between members that you find in other online communities. OMGosh I have no idea. I can tell you the last audio book I downloaded though. "The Virgin's Lover" by Phillipa Gregory. Not yet but I would love too. That would be so much fun, to hang out with people who share your planner enthusiasm. "Into the Woods" with my girls. "The Queen's Fool" by Phillipa Gregory. I am a total history buff. I am currently reading "The Virgin's Lover" and "The Other Queen" is next on the list. All of these are by Phillipa Gregory. 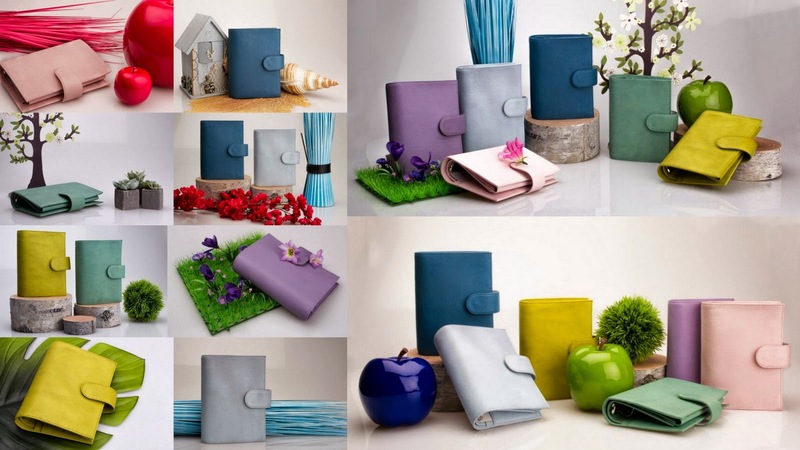 Some people are avid collectors of different binders, and others love decoration or the tactile feel of the different Filofax designs. On the other hand, many users see their organiser as a planning tool to help them set goals and progress towards achieving them. This week has featured several time management posts. Do you use your organiser(s) primarily for planning with monthly, weekly AND daily pages? Do you set and review progress to achieving goals on a regular basis? 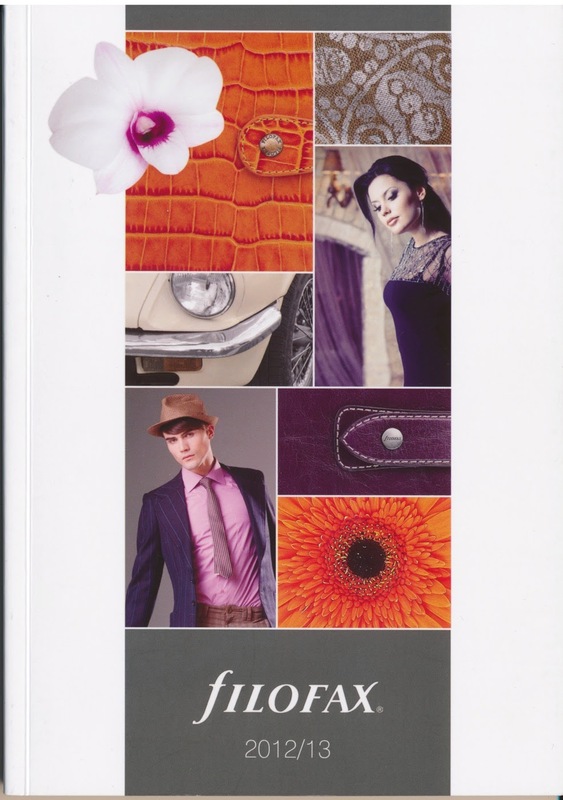 Ask yourself - is your Filofax collection really a hobby, or is it a way of life? Naturally as this is Friday please feel free to discuss anything ring bound planner or organiser related. 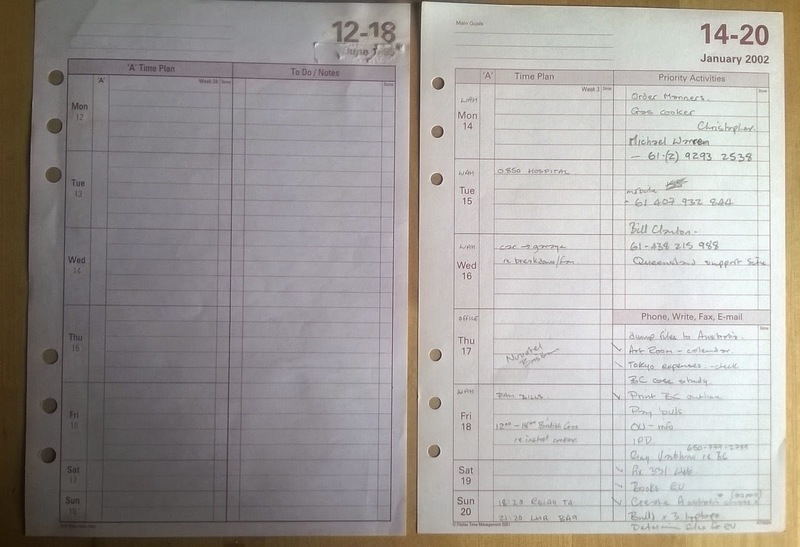 Yesterday we took a brief look at the time management systems that were competing against Filofax in the 1980’s and I asked why Filofax had not entered that market. It was almost the end of the century before they did – at a time that demand for paper-based time management systems was – surely - already largely exhausted. It came as a massive surprise to me, therefore, when I saw the launch of Filofax - The Professional System in a Viking stationery catalogue in 2003. Overwhelmed with email and yearning for a return to the glory days of paper, I purchased the new A5 system, directly from Filofax. It was the first official Filofax I had owned! But, from where did Filofax Time Management originate? James Noon (from ‘A’ Time) has provided the answers! He tells me that his first connection with Filofax was in 1997 when Filofax bought the intellectual properties of his successful system. Filofax also purchased the copyrights to his book, the ‘A’ Time trademarks, the designs of his ‘A’ Time pages and his customer database. 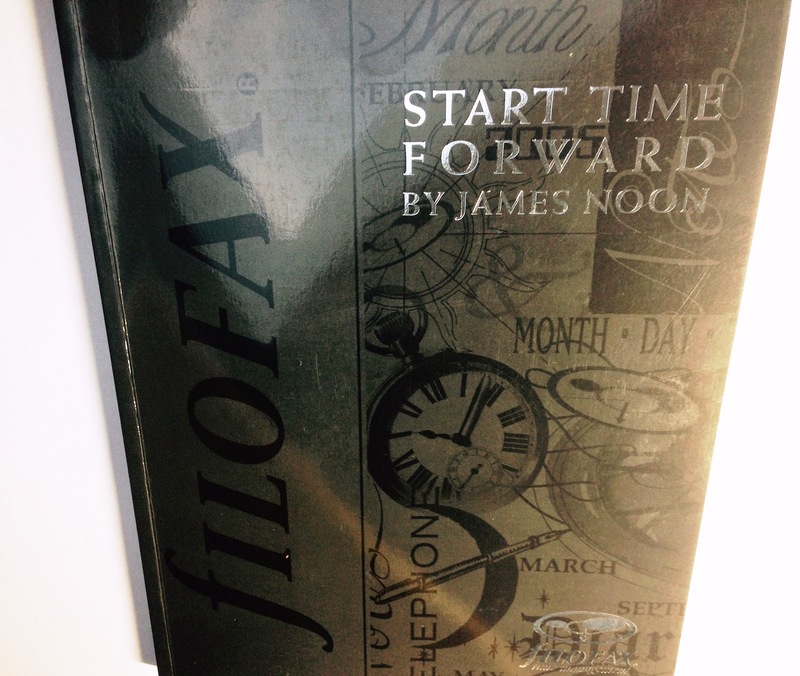 James wrote a book for Filofax in 1998 called ‘Start Time Forward’ which was all about planning forward from start times rather than planning backwards from deadlines. He also ran the ‘A’ Time training courses for the first couple of years under Filofax ownership. 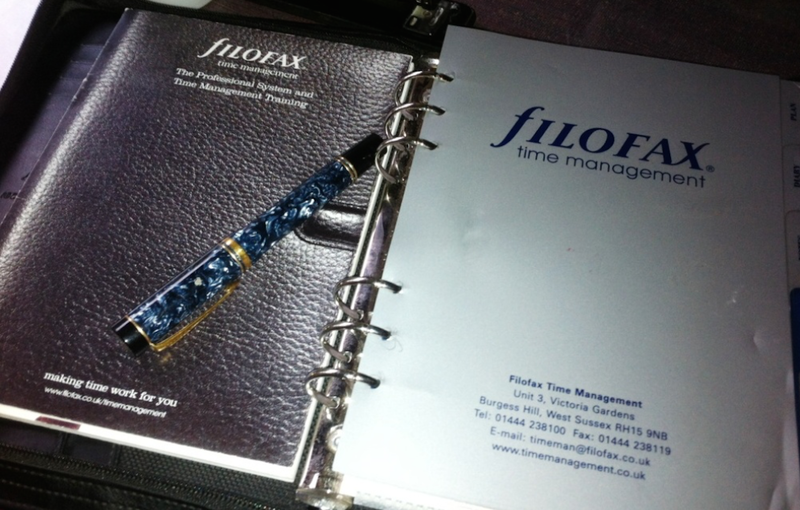 Filofax acquired the domain name www.timemanagement.co.uk in 1999 and launched in 2003. They still own it, but is now defunct. 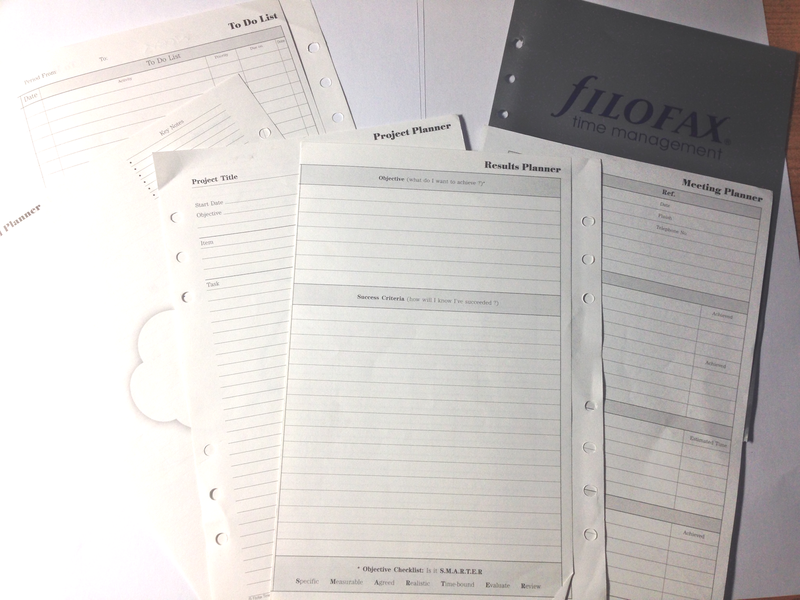 Production continued of ‘A’ Time pages with Filofax branding. They had very pale red headings and feint grey lines on white paper. Big changes were planned and in 2003 Filofax re-launched The Filofax Time Management brand as The Professional System and with slogans such as “making time work for you”, “time for business…time for leisure” and “a dynamic tool for smarter working. (Note that The Filofax Professional Organiser was the name originally given to the Deskfax system – not the same thing!). The ‘A’ Time forms and accessories were redesigned and the colours changed to black and white, presumably to save cost. James disagreed with this decision because the three-colour printing was a basis of the ‘A’ Time brand. 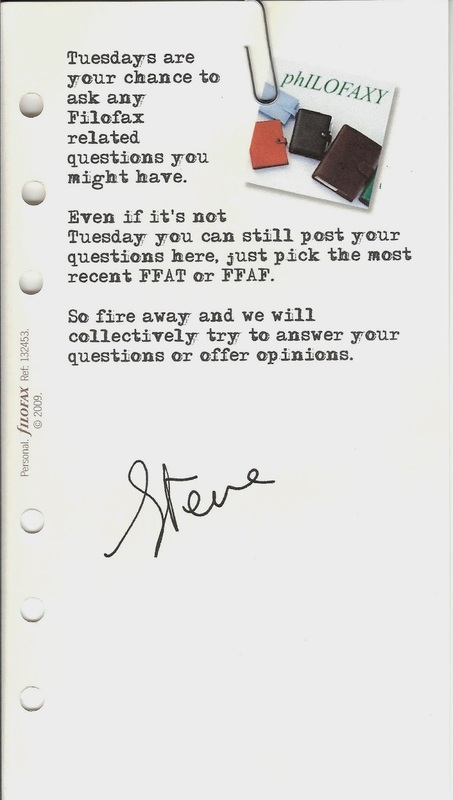 However, Filofax Group now owned that brand and references to ‘A’ Time were completely dropped! One thing that did not change was the discrete letter ‘A’ in the time plan column of pages and which was an important feature of the original system. It can still be found today on the dated products, but I had no idea that it related back to ‘A’ Time! At its height there were zipped and unzipped, leather and leather-look A5 options. There were two pages per day and two pages per week options and a Pocket Companion wallet and annual refill. Dated and undated stationery packs were widely available and each form could be purchased separately as you needed them. I found the Mind Map, Results Planner and Project Planner forms particularly useful. There was a user manual and advice on setting up your “Key Area Sub-Division designed to capture and manage dynamic information relating to your work under the sub-dividers”. Training courses were offered (still sub-contacted), particularly the one-day Time Skills Open Course, held in London, Birmingham and Manchester. I quickly discovered the biggest limitation of the system was size and weight. My leather look, zipped version was a standard A5 Logic Zip binder. Even with just the weekly contents, it weighed around 2kg! Furthermore, I now had a mobile phone and laptop to carry around, which I didn’t in the 1980’s. I persevered for a while but soon went back to my relatively lightweight Time Manager Compact size for general use, with my A5 Logic tethered to the desk. The last brochure I received came out in June 2006. The 44 page brochure of 2003 had become 22 pages in 2005 and just 10 in the final edition. Although the courses had been scaled back, the range was still intact. All reference to the Time Management range (apart from three remaining items) disappeared entirely as the new Filofax websites were rolled out, starting with the UK. You can still find the odd overseas webpage for the system standing in splendid isolation with no links to it! So, that’s it then? Well - no - it might not be quite the end! In 2010, James Noon decided to re-write ‘A’ Time, both as a new book (print and e-book) and as an e-commerce purchased self-training system. Part of that design will be that pages can be printed out in a format to suit an A5 ring-bound system and/or downloaded to a range of electronic devices (laptop, tablet, mobile). As part of this strategy, he asked for the rights to ‘A’ Time to be released back to him by Letts Filofax and this was granted. So it is James Noon who now owns new trademarks in the name ‘A’ Time (only in the UK at the moment). James describes his new venture as a ‘swansong’ (he reckons to be 70!). He reports that the book is already half completed and is now looking at the paper and electronic possibilities for using ‘A’ Time. I’m sure there are many Philofaxy readers who would be very interested in his re-vamped time management system in paper or digital format and we wish him well in developing this venture. With many thanks to James Noon for his very helpful and interesting answers to all my questions. www.jamesnoon.co.uk. Thanks too to David Popely and Cloudberry for the background information that enabled me to contact James. Copyrights to all material acknowledged. Thank you Tim for a brilliant two part guest post, now I know what that column is on those inserts! 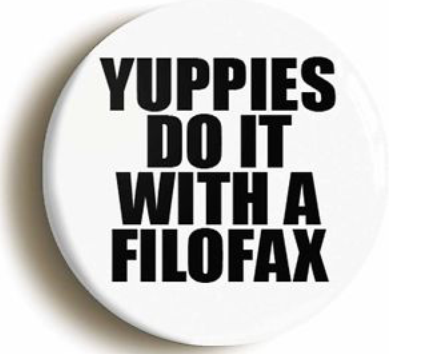 The Filofax was certainly an aspirational “must-have” in the mid-1980’s, leading to it becoming (usually in jest) one of the status symbols of the “yuppie” (“Young UPpwardly mobile Professional” or, in America, the “Young Urban Professional”). 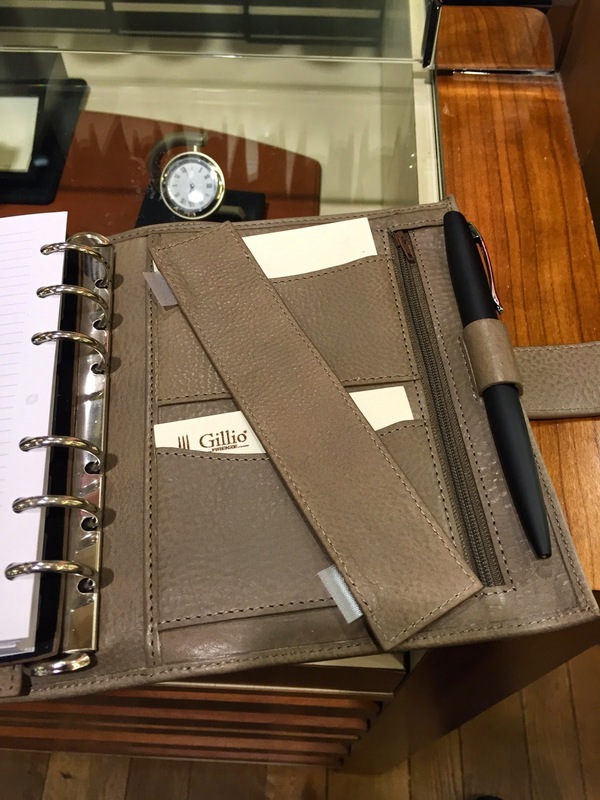 However, time management systems and training quickly became a serious competitor to the Filofax (and other brands) in business circles around the world. 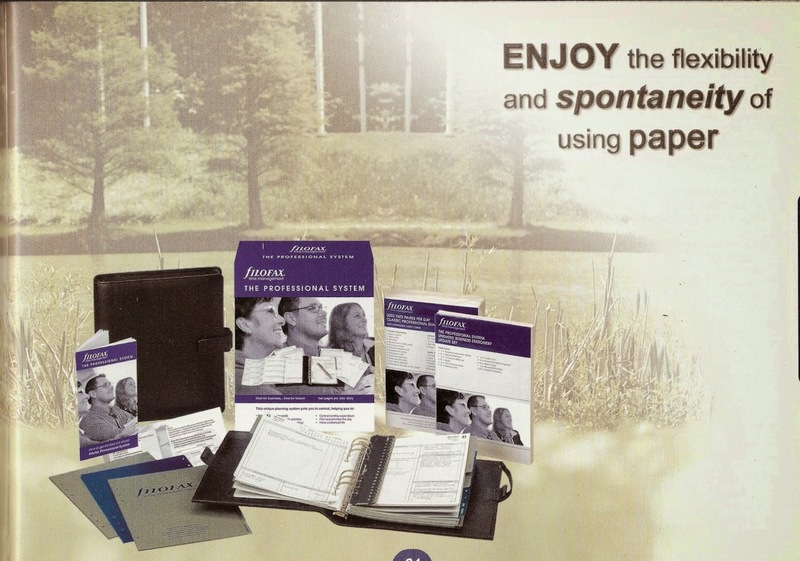 The typical Filofax was used as a standalone binder of punched inserts. Although there were many serious users, its contents were often little more than a weekly diary, address and phone/fax/telex numbers, expenses pages and assorted pre-printed (and rarely referred to) reference sheets such as a Chambers spell-checker, post-war wine vintages and international radio station frequencies! There were (and still are) several different systems produced around the world. I haven’t space to cover the American-based systems here but names such as Franklin, DayRunner and Pro-Planner by Day-Timer are well known. In Europe (but sold around the world), two Danish systems were the leaders. Time Manager (TMI) was created in 1975 by Claus Møller as “the world’s first results tool”. 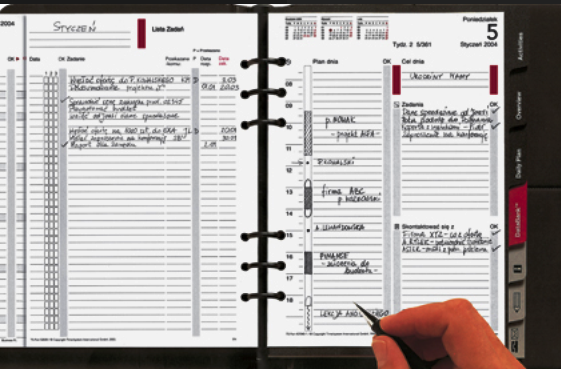 It still claims more than 400,000 people world-wide use Time Manager as their daily planner. Time/System with the slogan “Right things in the right time” came along in 1981. It claims to be the market leader in Europe and that more than a million people have used the system as their planning tool. It is still printed in 10 different languages. Me? I was a Time Manager devotee from 1987. I never attended the two-day TMI course (my company was too frugal) but I devoured the contents of the three booklets that came with my vinyl binder, colourful dividers and assorted punched pages. Each of the different systems really deserves a post of its own. 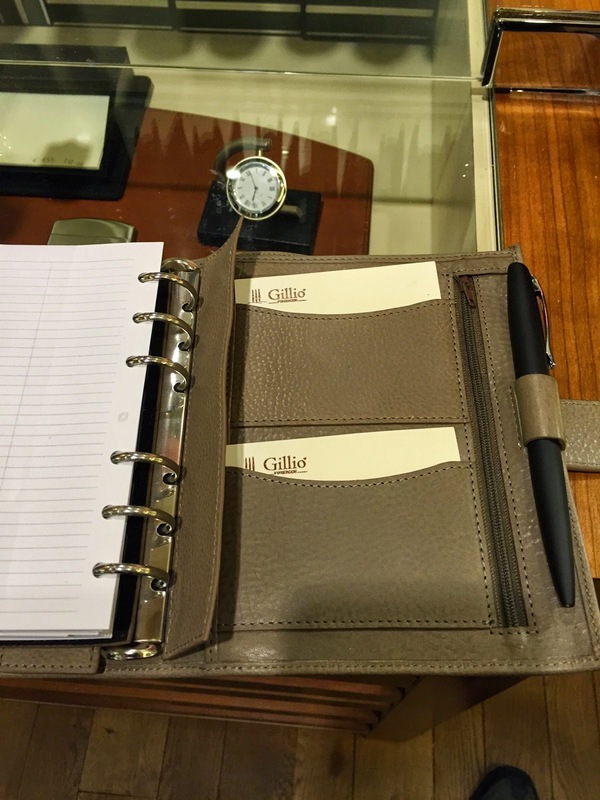 For now, let’s just ask, what makes a time management set-up different to a standard Filofax? Taking Time Manager as an example, central to its system is splitting every aspect of life into “key areas” and setting goals for each. With Time Manager, you have nine key areas – typically six for business and three for your personal life. A tenth tab is reserved for “bright ideas” that might come along at any time of the day or night! Still using up 30 year old leaves! “The Christmas Tree Principle” is an important way that you’re encouraged to look at your life with Time Manager. The tree trunk is you and the overall goals you’ve set yourself for your private and business life. The branches are your key areas on which to concentrate your efforts to reach your goals. The twigs are the major groups of tasks or projects and the pine needles are all your individual activities. The idea is to avoid what Time Manager calls “flapsi hapsi” where you’re just surrounded by hundreds of to-dos (the needles) with no overview or clear priorities! The other big attraction for me has always been the emphasis on long (annual and monthly), medium (weekly) and short-term (daily) planning and the relationship between each. In all systems, you are encouraged to look ahead, get fixed dates such as birthdays, tax returns and summer holidays written down first. You must plan monthly and particularly the week ahead before the end of the previous week (typically Friday afternoon), setting tasks and deadlines and allocating time to achieve them. Time management binders typically open out so that monthly, weekly and daily pages can all be viewed simultaneously. Try doing that with a modern app! A third player came along in the UK from 1984. 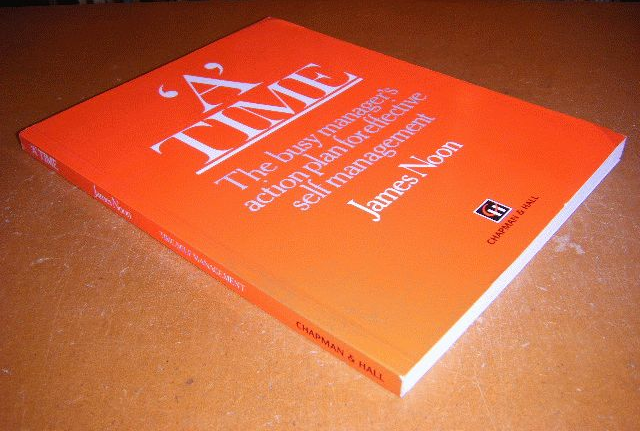 James Noon was a member of the directing staff at Henley Management College and wrote a book called ‘Time for Success’. James ran a number of workshops on time management at the college and these became very popular. He formed a joint venture company, called Business Time Systems in the UK with International Thomson Publishing. He bought this venture out in 1986 and at the same time he took a distribution license for the Danish Time/System product in the UK, which he combined with his ‘A’ Time ideas and training. In 1992 he launched his own planning system designing specifically for his book 'A' Time- The busy Manager's Action Plan for Effective Self Management. Like Time Manager and Time/System, ‘A’ Time became very popular around the world (Europe, USA, Japan, Africa and South Korea). 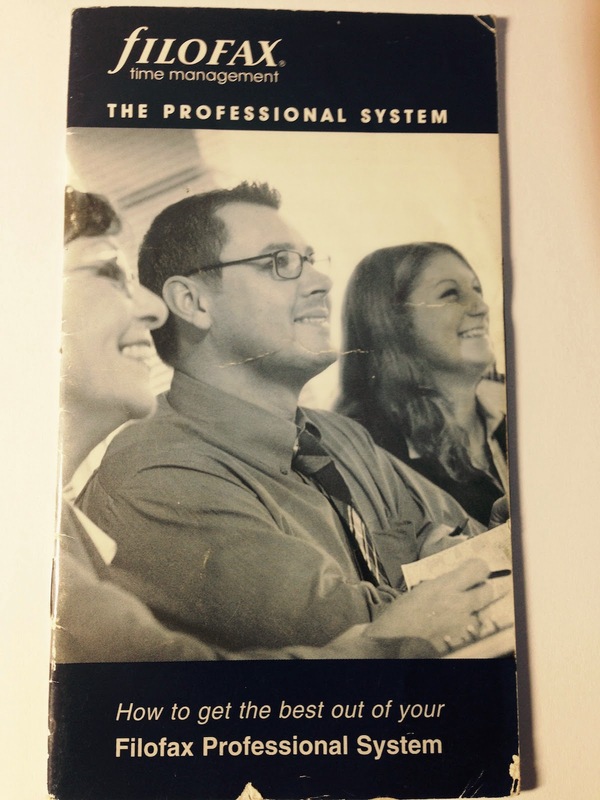 James states that he sold 750,000 books and that (literally) thousands of managers were trained in his system. Again, this system deserves a post of its own! Has anyone pictures of an original ‘A’ Time system or pages? Where did Filofax feature in all this? In a nutshell - it didn’t! With massive sales in the mid-1980’s, it was already a hugely successful company. Profits in 1986, for example, were £1.4 million on sales of £6.7 million. It was only when the company turned heavily loss-making following a collapse in demand in 1989 that the new owners (Transwood Earl) started looking into other products – such as different sized organisers (A5, M2, Deskfax etc) and different markets. Entering the time management sector didn’t come until the late 1990’s, by which time Filofax was owned by USA’s Day Runner and when paper based time management systems had been largely superseded by electronic PDAs such as the Psion organiser and desktop/ laptop packages. I used the “Time Manager for Windows” programme from about 1993 and packages such as Microsoft Outlook for Windows were well established by 1997. 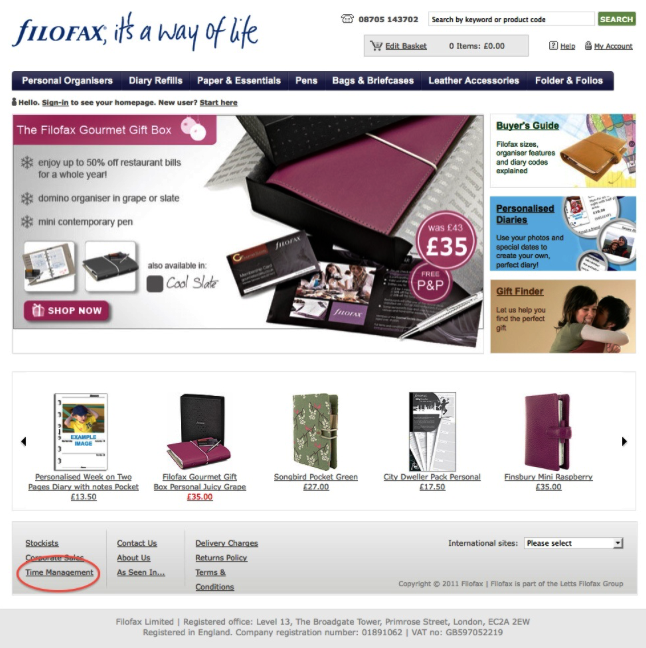 Tomorrow, I’ll delve a bit into the origins of Filofax Time Management, its’ products and short-lived existence together with a look at the final catalogue from 2006. My Week - Week 11 (with new Filofax!) - Tapes and Stickers and Pens... Oh My!